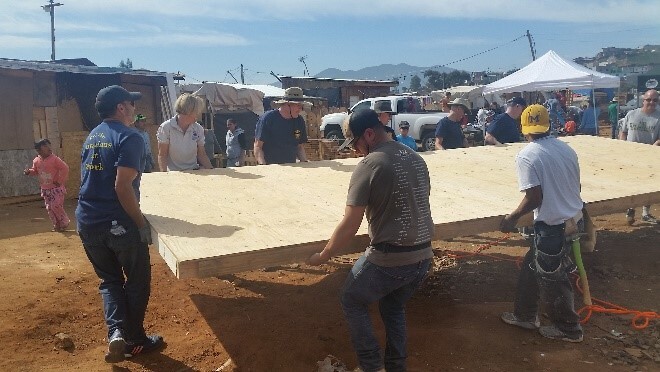 The Rancho Bernardo Sunrise Rotary Club teamed up with the Del Mar Rotary Club to build a house in a day. Here's a first-hand account of an experience that changed every life it touched. Awaking at 4:30 am I wasn’t thinking too clearly. Put on sloppy clothes. Eat breakfast. Take your passport. Stay focused driving. Arrive safely. 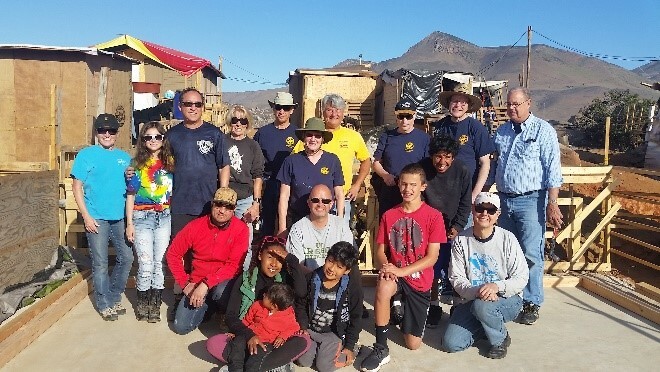 Our 15 intrepid Rotarians and family members drove from Scripps Ranch, arriving at the border by 6 for a bathroom break, then pushed on to our construction site by a little after 7. 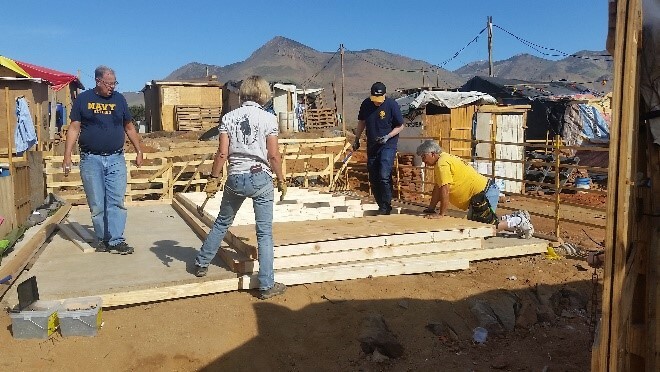 Members of the Rancho Bernardo Sunrise Club were joined by five Del Mar Rotarians wanting to test the idea of a house build as a club project. They were in for an experience like none other…one that is guaranteed to forever change the life perspective of its participants. The first thing that struck us was the smoke. Everywhere you looked the air was acrid. In my haste to prepare amidst everything else in the previous work day, I’d forgotten to bring my mask. SIGH. This wouldn’t be pleasant. 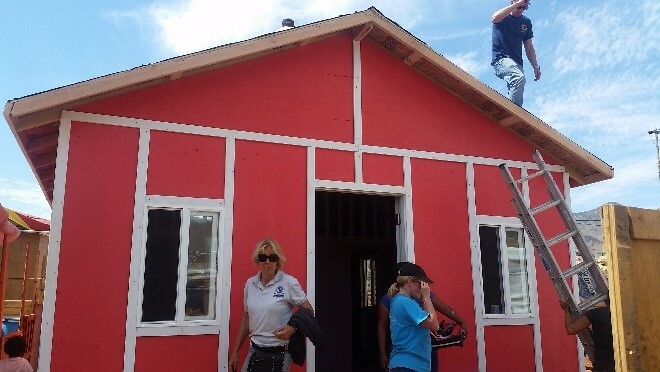 We arrived, driving over broken streets, then dusty hills, with a simple goal: build a 360 square foot house in a day. 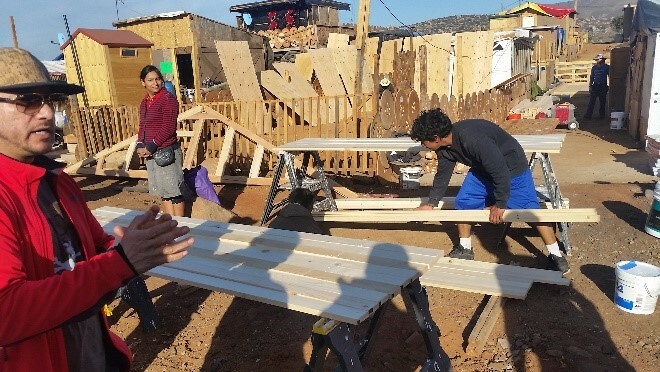 Working with Project Mercy, our club had used the proceeds of our Rancho Beernardo fundraiser to buy a kit for about $6,000. 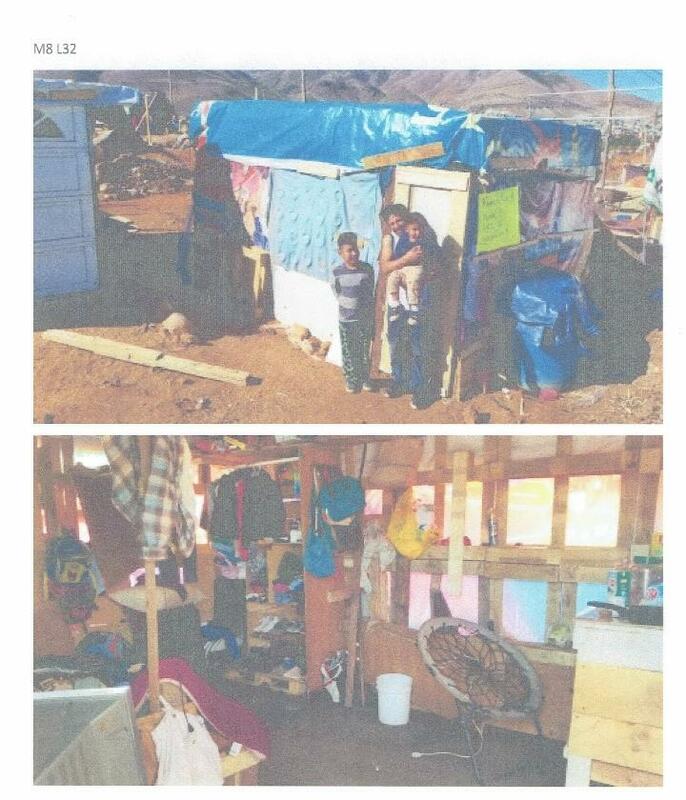 We were determined to improve the lives of the Alvarez Marin family. 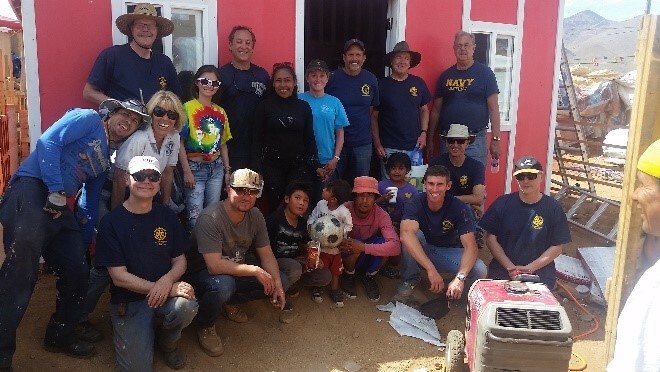 “Their house is made of scrap wood and a variety of sheets of plastic,” advised team leader Tony Nogales. To clear the site for his new home, Rodrigo (the father) had set fire to area boulders to break them into smaller pieces. I’ve gone on house-build projects three times before, usually dragging along family and friends. In the past I’ve seen groups of up to 50 build a house in 8 hours. I’ll confess that, despite having done this before, I’m always overwhelmed by the emotion. The night before my friend Max had argued we’re making ourselves feel better but doing the recipients no favors by discouraging native workers. 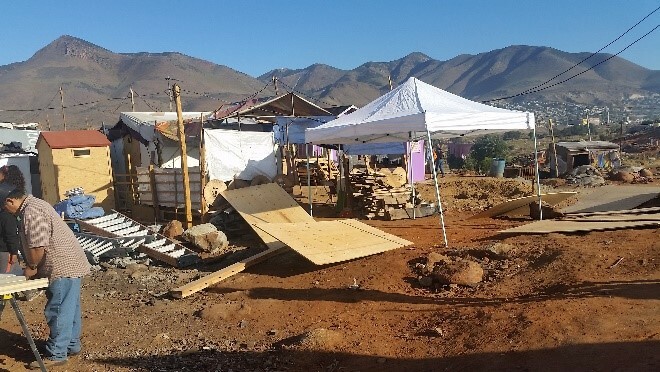 Yet as I considered the conditions these families were living in, I realized that without the help of groups like ours they’d get no other assistance. There was plenty to do in this one small community, yet I saw only one other team building a house next door to us. 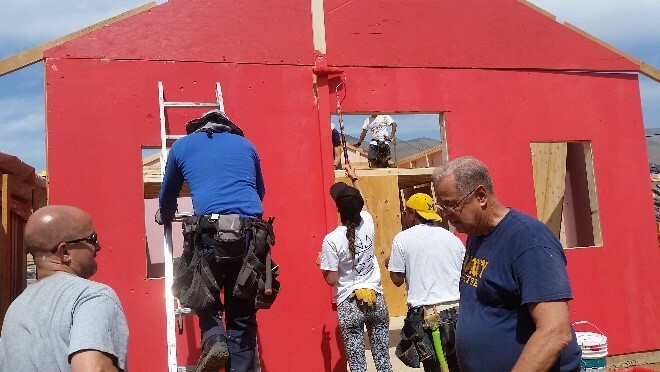 Nobody else was rushing in to help, and no government agency was building better housing for them. Nope…for good or ill, we were probably all these people had. 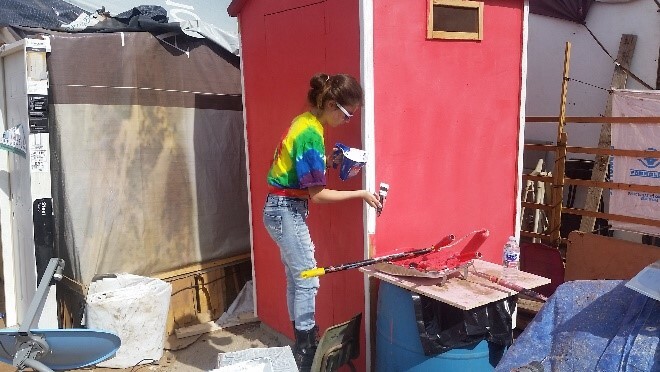 The sun greeted us as we began swinging hammers and paintbrushes. Pop-up tents a short way from the actual site helped, but there was no respite from the overbearing heat for those doing the work. The choking dust didn’t help either. We scurried to get as much done as possible while the temperature remained cool. And do it we did, each finding areas in which we could excel. 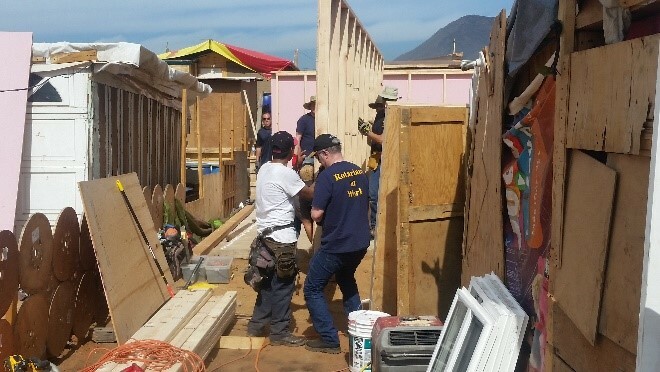 Moving quickly past the existing structure and newly-built outhouse, we were able to make fast work of framing. As four stray dogs wandered in and out of our site, we had a friendly competition with the group next door (we finished first, though they stuck around to finish putting on the shingles). Working side-by-side with the recipient family and their neighbors, we found the community staying with us all day, watching our vehicles and allowing us to stay focused on what we needed to do. In the neighborhood there were other homes already built from similar kits, which helped to inspire us. But all one needed to do was look at the current conditions in which this family lived to remember why we were here. Their fencing made of old packing crates, shipping pallets, and computer cable spindle caps went by in a blur as we dashed to and fro, anxious to meet our deadline and go back to our own comfortable homes. It didn’t take long for the project to take on a rhythm, though, and the old “insert notch A into slot B” mindset kicked into place. Frames popped up and started getting notched together. Painted items, drying almost as quickly as the paint was applied, would be set aside as a piece to be incorporated into the larger puzzle. We’d also been advised to bring along water, snacks and lunch, and breaks were frequent as the sun blazed above us. Such breaks gave us each an opportunity to look around at the details of these people we’d never met and would probably never see again. The burning rocks, the dust, the heat. The luxuries they lacked, but that we take for granted, was what really caught my breath. 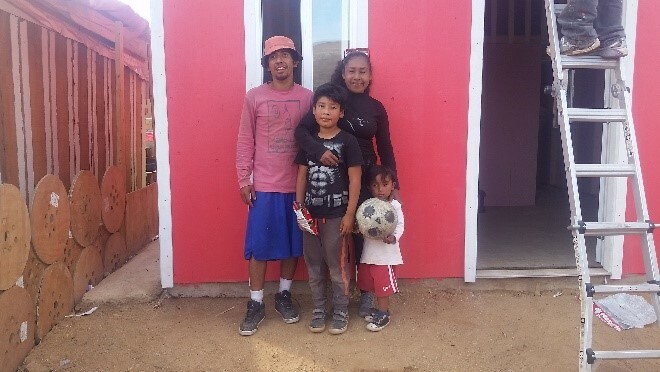 Our ability to make a phone call, to turn on a light switch, have indoor plumbing, or to get clean water by turning a faucet…none of these things existed for the Alvarez Marin family. In fact, the entire community gets their water once a week from a government truck. In this part of the world there is no infrastructure as we know it, and issues we complain about on this side of the border are things these people would happily accept as a huge improvement to their lives. It gave me pause to realize I had in my pocket a passport, driver’s license and a hastily grabbed $20 bill in case we stopped for a beer on the way home. That $20 I was ready to part with so easily was probably a day’s wages for any one of these families. Yet despite the dirt-poor conditions in which these people live, just 35 miles from my home, the one thing that struck me more than anything else was that they’re happy with their lives. Perhaps those of us with First World problems could learn something from them. For hours on end the sounds of hammering and the swishing of brushes and rollers never seemed to stop. Everyone was focused on doing their job or helping the person next to them to finish their task. And while the occasional cell phone popped out for taking photographs, daily distractions like jobs, online gaming, music, and the rest were set aside as we all shared this single goal. trim, but you could at least see it was really going to be a house. Feeling like an ant colony, the activity never stopped. Even as one group would seek some shade, a drink, or a bite to eat, others would jump in and take over. This constant turnover kept a steady flow of energy, all guided by professional staff from Project Mercy. We knew we were all in good hands, and that the roof would not cave in after we left at day’s end. At last the end was in sight. Windows were installed, the ladder was painted, the safety gate put up the edge of the loft. Nails set in the wrong place were replaced, and touch-ups were made. Volunteers started drifting off to other obligations, and people started talking about wrapping up and heading home. By 3:30 with all but the roof shingles in place and members of the community beginning work on the electrical wiring, our plucky troupe held a small ceremony in which Tony told them (and translated for us) how grateful we all were that they’d allowed us into their lives for the day and how much more we’d all gotten from the experience than they had. Handing over numerous household supplies to the family and the keys to Beatriz (the mother), we headed north towards a two-hour wait at the Otay Mesa border crossing. 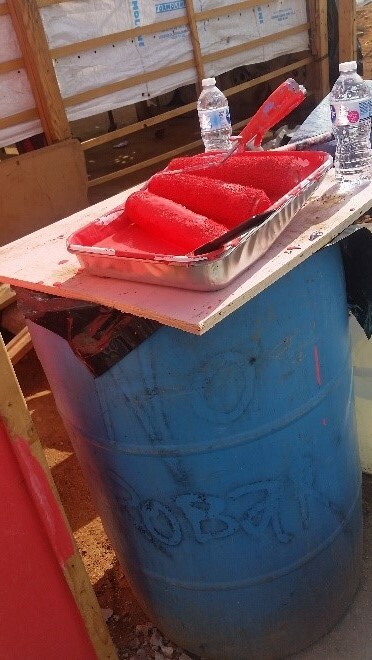 Arriving home at 7pm, I peeled a layer of mud from my body and relegated my clothes to the washer, knowing they were forever adorned with white, pink and red paint.